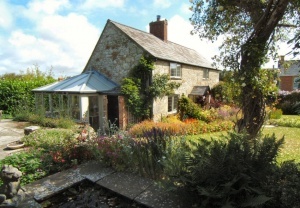 Imagine the perfect period stone cottage surrounded by beautiful cottage gardens and you抣l find yourself transported to this property. 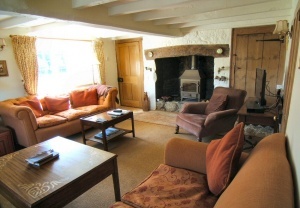 慤nion Cottage� combines all the character features of beams and fireplaces with light and airy rooms and views across to the open countryside. 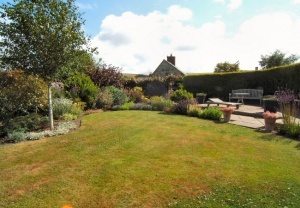 It has everything you could wish for with its two reception rooms, large farmhouse kitchen and conservatory which leads you out to the terraces and immaculate landscaped gardens. 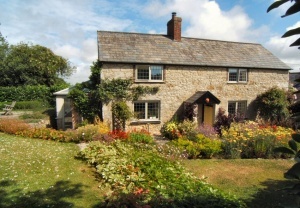 There is off road parking, central heating, double glazed leaded windows and the property is offered chain free. The village of Whitwell has one of the oldest pubs on the island and a wealth of lovely walks all around. 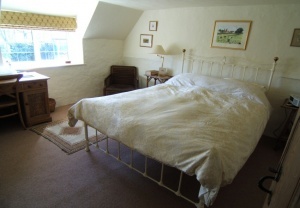 A double aspect room with views to the countryside at the front and to the lovely garden at the side. 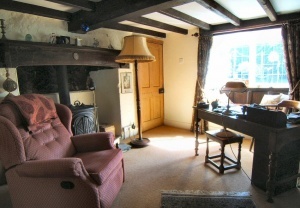 White painted ceiling beams, large inglenook fireplace with feature wooden lintel, stone hearth, currently housing multi-fuel stove. Under stair cupboard with wooden door to the side. Radiator. Door to further hallway. DINING ROOM: 13�x 10�br />Window to side garden, another impressive Inglenook fireplace with wooden lintel and stone hearth, currently housing multi-fuel stove. 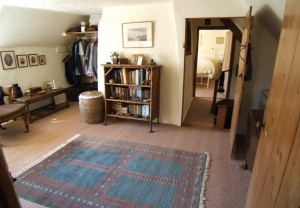 Exposed ceiling beams, radiator, built-in cupboards and staircase to first floor. KITCHEN: 13�x 10�br />A large farmhouse style kitchen with window to rear overlooking garden terrace, glazed door into conservatory and wooden door to further hallway. A fitted cream kitchen with a range of base and wall units with wood worktops and tiled splash-backs. Raeburn, integrated fridge and double stainless steel sink with swan neck mixer tap and drainer. Radiator. Whitewashed brick wall and ceiling beams. Terracotta colour tiled floor. 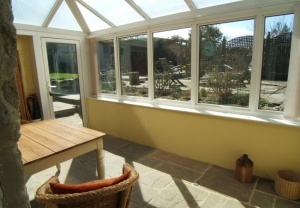 CONSERVATORY: 12�x 7�br />With pitched polycarbonate anti-glare roof, windows on two sides and glazed door to rear garden. 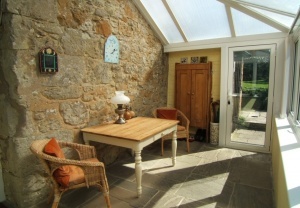 Exposed stone wall and flagstone type flooring. 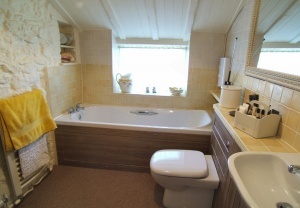 With ceramic tiled floor, doors to living room, utility room, bathroom and separate shower room. High level shelving. 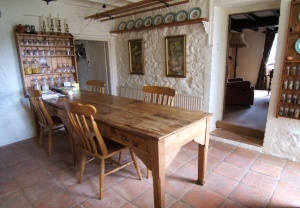 Whitewashed stone wall and ceiling beams, window to side. A white suite with panel bath with mixer tap and tiled surround. Vanity unit with inset wash hand basin and mixer tap. Low level w.c. concealed cistern, ladder style heated towel rail and radiator. Velux window, white tiled wall, some wood tongue and groove cladding, terracotta coloured ceramic tiled floor. A white suite with shower cubicle glazed on two sides, pedestal wash hand basin and low level w.c. Radiator and heated towel rail. A large well equipped utility with window to front and far reaching views across the countryside. 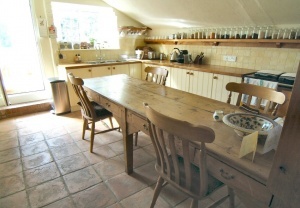 Fitted with a range of base and wall kitchen units with worktops and sink and drainer. Radiator and whitewashed stone wall. Door to front path. With wooden doors to bedrooms one and two. Window to side overlooking gardens, radiator and feature nook. BEDROOM TWO: 13�x 10�br />Window to side overlooking gardens, radiator. Loft access and door to bedroom three. 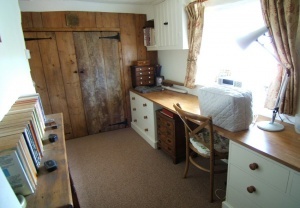 Window to front, radiator, built-in cupboards and drawers. Loft access. 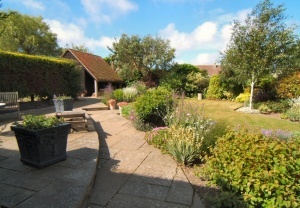 The crowing glory of this property is the superbly presented landscaped garden with its series of distinct areas to suit every mood and occasion. 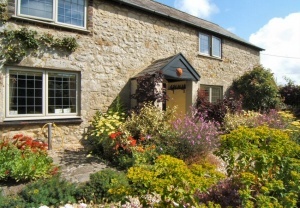 There are terraces, manicured lawns and mature shrubs. 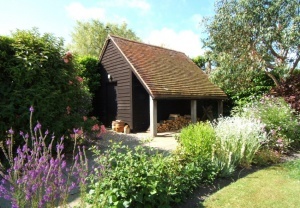 The garden also contains a substantial wood shed which has been added by the current owners and which has been designed in keeping with the period of the cottage and has a deep tiled pitched roof, dark stained weatherboard cladding and attractive timber pillars. There is a further brick built store attached to the main cottage and discretely located behind trellising is a gravel parking area.